The ability to make a fire I think is an assumed skill that many people think they have and in turn decide that there is not skill work needed. Packing a lighter, some waterproof matches, and maybe a Ferro rod and some sure fire tabs is what some consider adequate preparation for fire making. For many people you can make a fire by lighting a match or sparking a lighter and then you have your flame to start your fire. When you look at fire from a prepping/bushcraft perspective it quickly becomes clear that fire is important. Fire helps to keep us warm, dry out wet clothes, make drinking water safe, cook a meal, and provide light and to signal with. Without fire your chances of survival go down. In a survival situation where there are no modern ways of staying warm, cooking a meal, or boiling water the need for fire becomes a top priority. The importance of having a fire kit and knowing how to use it in all weather conditions is crucial. A Fire kit is more than just a bag with a few things thrown in with little to no thought provided. A good fire kit will have different sections that together will help to ensure the ability to make fire. These sections should include the fire kit and a separate tinder bag as a start. Before I go into some of the components of a fire kit I want to say that modern methods of fire making are acceptable to have in any fire kit. There will be some who think a fire kit should be primitive methods only, and others modern methods only. The fire kit can have both as long as you know how to use them, practice making fire with them, and use them correctly. Making fire is a skill and it is not as easy to do as some people think. Weather conditions, methods and tinder can all help or hinder the process. Being able to make a fire in the worst of conditions can be the difference between life and death. Fire kits are a very individual so each will be different but each should contain some of the similar items I will list below. Before I list the contents I would like to talk about the container or case your fire kit is stored in. Some people like using an altoids tin and others leather, cloth or nylon pouches. Some are very high-tech items like a maxpedition nylon zippered case and other will be low tech such as hand stitched leather pouches or a material pouch. My case is an Elk hide bag that has an antler button to close it. This pouch has been rubbed with bear tallow and beeswax to make it very water resistant. Remember each person’s bag will be different so pick something your will like. The Fire making component should have some or all of the following: Ferro rod and striker, Magnesium rod, waterproof matches, lighter, Flint and steel, Fresnel lens or other magnifier, a 9 volt battery and steel wool. These items will allow you to make a flame or ember in which you can start a fire. You should always have more than one way to make a fire. I often can redundant items to make fire with some in my fire kit and others in my rucksack. 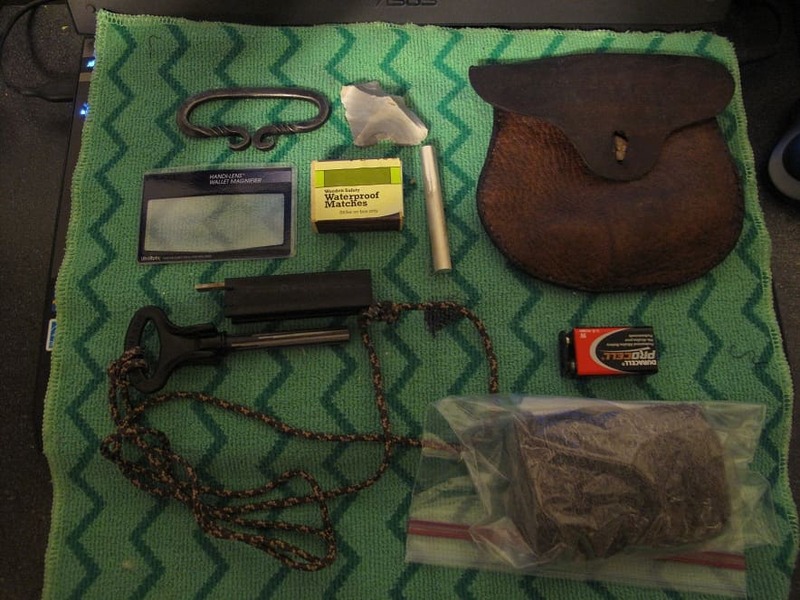 In addition to a fire kit you should have a tinder pouch, bag, or tin. Having dry tinder is just as important and having the other tools to make flame or ember. 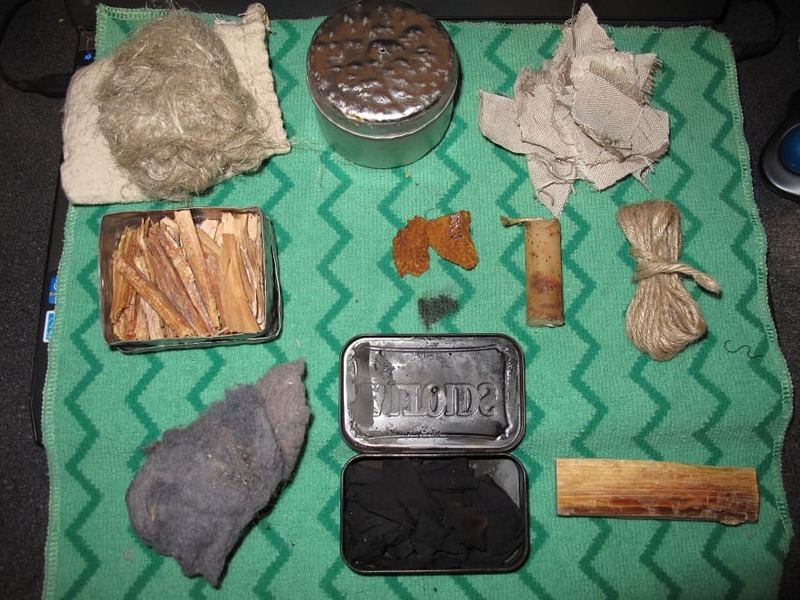 Some common items are: Tow, jute twine, char cloth, fatwood, wet fire, waxed soaked cotton pads, cotton balls soaked with petroleum jelly, chaga, and punk wood. All of these items will help you to hold and ember that can be put into a bird’s nest of material to blow into flame or are items that will hold flame for five minutes or more as you apply twigs and other smaller tinder. Not everyone will have these items and others will have items not listed here. The important thing is to have some of these items to help you make fire. A small metal tin should be carried with a small hole in the top to assist in making char cloth. In addition you could also have a small tin with a lid and no hole in it for your punk wood so you can prevent it from burning up once your tinder had lit. In regards to tinder I think it is important to note that having ready-made tinder with you is important I also think you should be able to find natural material out in the field to me able to make fires with. Char cloth, juts, cotton balls and other man-made material will run out. It is when you don’t want to waste precious resources that you most need to know how to find tinder material. Fatwood, Chaga, birch bark, dried grass, and punk wood are all natural materials that many people should be able to find in their local woods. Learn how to use those kinds of tinder first and in poor conditions, and you will truly be able to make fire anywhere. It is important to not just know about these items and to carry them but it is also important to practice making fire with them in all kinds of conditions. It is easy to make a fire in perfect conditions, but not so easy when it’s wet, humid or really cold. It is during those times that fire will be most critical to have. I do not want to forget to mention the bow drill. As a fire making device the bow drill is very handy but does take some practice to get very good with it. Bow drill can be made anywhere you have trees so it can be made in the field. Watching a YouTube video or reading about how to do something is okay to learn but experience is still the best teacher. Practice making fire and do it often and this skill will be ready for you to use when you need it the most.